Just Cooking N Baking ....: Mysore Pak | A Royal Sweet from Mysore | Gram Flour Fudge | ಮೈಸೂರ್ ಪಾಕ .. Simple and easy way of Cooking N Baking .. !! Mysore Pak | A Royal Sweet from Mysore | Gram Flour Fudge | ಮೈಸೂರ್ ಪಾಕ .. The following recipe makes around 20 medium sized pieces. * Heat 2 table spoon of ghee in a non stick pan and add in gram flour. Roast this continuously in a low flame until you get a good aroma from gram flour. Switch off the flame and transfer the flour into Metal sifter. * Sift the flour to remove any lumps and divide the flour into 3 batches. * Grease the steel plate with 1/2 tea spoon of ghee. * Heat a large non-stick pan in a medium flame and add in sugar and water to it. * Once the sugar syrup is ready, slowly start adding sifted gram flour in batches. As soon as one batch of gram flour is mixed with sugar syrup add in the next batch until all the gram flour is mixed well without any lumps. * Keep stir the mixture for 2 minutes. * Repeat this process until all the ghee added into gram flour-sugar mixture. * Once all the ingredients are added, continuously stir it for 1 minute. * Now yellow color of gram flour-sugar and ghee mixture will change color and become thicker. And also this mixture will start to leave the sides and bottom of the pan. * Keep stir the mixture for 45 seconds or 1 minute and switch off the flame and IMMEDIATELY transfer this mixture to already greased steel plate. * Let the mixture to cool down for 3 to 4 minutes and cut them into desired shapes. * Let the Mysore Pak to cool down completely before taking them from steel plate. Store them in a air tight container. * Use a same cup to measure ingredients. * Keep everything ready before you start preparing Mysore Pak. * Be very careful while adding hot ghee into gram flour - sugar mixture. Mysore Pak was first prepared in the kitchen of the Mysore Maharaja. Kakasura Madappa who was the cook at the Mysore Palace kitchen sweets department simply tried a combination of gram flour, ghee(clarified butter) and sugar. When the King asked for dish name,Madappa simply named it as a ‘Mysore Pak’,a delicacy from the Mysore Palace. Then Mysore Pak attained the position of a Royal Sweet. Parceling Mysore Pak to Anu,Soumya&Recipe Junction. looks sooo fabulous n tempting.. Perfectly done! Nice recipe dear..
Just awesome! Keep it up. Wish you all the best. that is fabulous!! super tempting and delicious!!! Thanks for linking it to my event!! Looking for more yummy recipes!! * Copying the contents without my "WRITTEN" permission is a Violation of the Copyright notice. * Feel free to contact me at just4cooking@gmail.com for any queries. 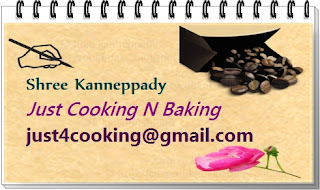 Beaten Coffee - Video recipe ..
Just Cooking N Baking by Shree Kanneppady is licensed under a Creative Commons Attribution-NonCommercial-NoDerivs 3.0 Unported License. Based on a work at http://easycooknbake.blogspot.com/.